The past couple of runs, we’ve altered our route. Instead of running through the Olmsted Parkway system, we changed it up and went straight toward Hoyt Lake. Once there, we curve around and up a decent hill, across a looping pedestrian bridge over a highway, and into a beautiful section of Buffalo. 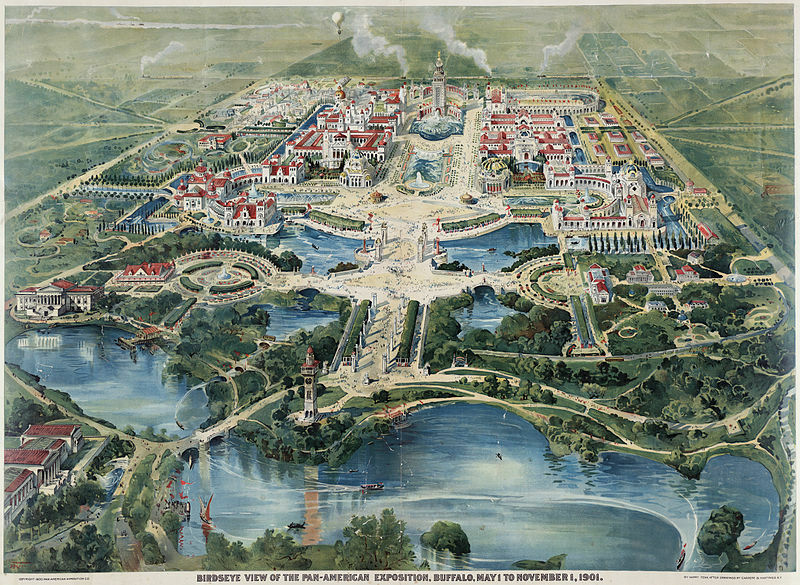 This new neighborhood (at least new to us), was once the center of the Buffalo Pan-American Exposition of 1901. Our apartment is actually a Pan-Am 1901 building that was used to house visitors to the exposition. This image is available from the United States Library of Congress’s Prints and Photographs division under the digital ID ppmsca.07832. I love this image because you can really trace the route we still take today—almost identically—to get to the Pan-Am Expo. If you start in the bottom left-hand corner, we zip down past the Albright-Knox Art Gallery, over the bridge crossing the lake, up past the tower (which is no longer there), and then into the center of the Expo. Now, over one hundred years later, it is a beautiful residential neighborhood with some of the most spectacular mansions in Buffalo. It is pretty refreshing to see all of the history Buffalo has to offer, and exploring it by foot has opened up all new areas of the city that we wouldn’t necessarily explore by car. It is also a great feeling knowing that we have a ton of great options for our runs, be it our standard parkway system, into the actual parks around the lakes, and now through a history-rich area. In short, Buffalo is where it’s at. So whether you find yourself sick of staring at a wall or TV screen while running on a treadmill or you’re tired of running down the same old streets, Ellie and I have found that a simple change can make us pretty excited to to go out and run. We’re excited to explore a new neighborhood, see the houses and yards with fountains (seriously, some of these mansions are ridiculous), and try out some new terrain. This is why I can’t believe I was able to run on the country roads where I grew up. Running around the block was a four-mile run where one “block” was one mile, straight and flat. Now I need something, ANYTHING to change it up: a turn here, a hill there, a set of stairs for good measure, something.